I'd like to use my points on this one too! I love the cover of this one so much! And would love to be added if possible! Omg ME! I would love to read this! first thought to enter my head? Oh My God Yes! I've been wanting this since I heard there was a 2nd book. OH, I want this one so bad! Oh, totally want to read this! Just posted this as our Waiting on Wednesday pick. Can I be added please! I will use 10 points to be guaranteed a spot on this tour. AHHHHH!!!!! I loved If I Stay! PLEASE! I forwarded this on today (received my own copy) so the DC is the same. Mailed two days early on 02.09.2011. USPS delivery confirmation number: 0310 2640 0002 4421 4119. 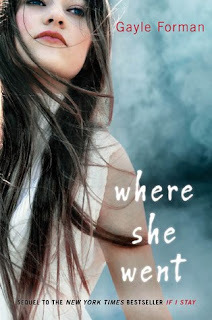 Received Where She Went today, 4/4!